For the participant in Yeardot, see Yeardot. Sir Simon David Jenkins FSA FRSL (born 10 June 1943) is a British author and a newspaper columnist and editor. He was editor of the Evening Standard from 1976 to 1978 and of The Times from 1990 to 1992. Jenkins was born (1943-06-10)10 June 1943, in Birmingham, England. His father is theologian and United Reformed Church minister Daniel Thomas Jenkins. He was educated at Mill Hill School and St John's College, Oxford, where he read Philosophy, Politics and Economics. After graduating from University of Oxford, Jenkins initially worked at Country Life magazine, before joining the Times Educational Supplement. He was then features editor and columnist on the Evening Standard before editing the Insight pages of The Sunday Times. From 1976 to 1978 he was editor of the Evening Standard, before moving to become political editor of The Economist. He edited The Times from 1990 to 1992, but since then has primarily worked as a columnist. In 1998 he received the What the Papers Say Journalist of the Year award. On 28 January 2005, he announced he was ending his 15-year association with The Times to write a book before joining The Guardian as a columnist. He retained a column at The Sunday Times and was a contributing blogger at The Huffington Post. He gave up both on becoming chairman of the National Trust in 2008, when he also resumed an occasional column for the London Evening Standard. On 14 April 2009, The Guardian newspaper withdrew one of his articles from its website after former African National Congress leader and South African President Jacob Zuma sued the paper for defamation. In February 2010, Jenkins, who had been in favour of the Falklands War, argued in a Guardian article that the Falkland Islands are an example of anachronistic British colonialism and should be handed over to Argentinian control. He said that they could be leased back under the auspices of the UN. He remarked that the 2,500 or so British islanders should not have an "unqualified veto on British government policy". In March 2012, he stated on Question Time that Britain should begin negotiating the handover of the Falkland Islands to the Argentine government. Only his fellow panellist Alexei Sayle agreed; the others and the audience disapproved. In 2010 Jenkins spoke disparagingly on the Radio 4 Today programme about the Shard, a skyscraper in south London. Jenkins has expressed varying opinions on the subject of national defence. In a piece in The Guardian in 2010 he wrote that the government should "cut [defence], all £45 billion of it... With the end of the Cold War in the 1990s that threat [from global communism] vanished." However, he wrote in the same paper in 2016 in support of NATO membership, saying: "It is a real deterrent, and its plausibility rests on the assurance of collective response." Jenkins voted for the UK to Remain within the European Union in the United Kingdom European Union membership referendum, 2016 arguing that leaving would provide Germany with dominance over the remainder of the union: "It would leave Germany effectively alone at the head of Europe, alternately hesitant and bullying". Jenkins has written several books on the politics, history and architecture of England, including England's Thousand Best Churches and England's Thousand Best Houses. More recently in his A Short History of England, he argues that the British Empire "was a remarkable institution that dismantled itself in good order." He wrote that England is "the most remarkable country in European history." In July 2008, it was announced that he had been chosen as the new chairman of the National Trust; he took over the post from William Proby in November of that year. Although Jenkins had in the past been critical of some aspects of the Trust's work, he said he was "very pleased" by his appointment, and that the Trust was "one of England's great institutions". As chairman of the National Trust, a post he held until November 2014, Jenkins campaigned vociferously against the building of new houses, although according to then housing minister Nick Boles he himself owned "at least two homes". Jenkins married the American actress Gayle Hunnicutt in 1978; the couple had one son. They separated in 2008 and have since divorced. He married Hannah Kaye in 2014. Jenkins was appointed a Knight Bachelor for services to journalism in the 2004 New Year honours. ^ Kaye, Elaine. "Jenkins, Daniel Thomas in OxfordDNB". Retrieved 20 October 2013. ^ Timms, Dominic (27 January 2005). "Times columnist Simon Jenkins to join the Guardian". The Guardian. London: MediaGuardian. Retrieved 2 April 2010. ^ a b c McSmith, Andy (5 July 2008). "Sir Simon Jenkins: History Man". London: The Independent. Retrieved 1 May 2010. ^ Jenkins, Simon (9 September 2010). "Simon Jenkins @ The Huffington Post". The Huffington Post. Retrieved 15 September 2010. ^ Ponsford, Dominic (19 January 2009). "Simon Jenkins column returns to Evening Standard". Press Gazette. Archived from the original on 16 June 2011. Retrieved 1 May 2010. ^ "Zuma sues London's Guardian". South African Mail & Guardian. 14 April 2009. Retrieved 1 May 2010. ^ Jenkins, Simon (25 February 2010). "Falklands... Britain's expensive nuisance". London: Guardian. Retrieved 27 February 2012. ^ "A visually exciting building ... in the wrong place". BBC. 9 December 2010. Retrieved 19 January 2011. ^ "War of Jenkins' ear". Private Eye. London: Pressdram Ltd. 2 September 2016. ^ "I fear German dominance. That's why I'm for remaining in the EU". The Guardian. 16 June 2016. ISSN 0261-3077. Retrieved 27 July 2017. ^ Oliver Kamm (3 September 2011). "Simon Jenkins's potted history of England". The Times. 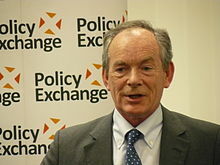 ^ Simon Jenkins (24 September 2011). "The potent sweep of English history". The Daily Telegraph. London. Retrieved 25 September 2011. ^ "Millennium Commissioners". Millennium Commission. Archived from the original on 30 March 2012. Retrieved 5 December 2009. ^ Kennedy, Maev (3 July 2008). "Writer Simon Jenkins to chair National Trust". London: The Guardian. Retrieved 1 May 2010. ^ McSmith, Andy. "And we still don't know how many homes Sir Simon has". The Independent. Archived from the original on 21 March 2013. Retrieved 26 February 2015. ^ Eden, Richard (26 July 2008). "Sir Simon Jenkins's wife files for divorce". Daily Telegraph. Retrieved 19 October 2016. ^ Shakespeare, Sebastian (17 November 2014). "National Trust chief, 71, weds his young treasure". Daily Mail. Retrieved 19 October 2016.